Users love responsive applications. If you want to enable this kind of great user experience, you’re going to need well-performing storage. But what kind of storage? Large enterprises have several options, e.g. local attachment storage, shared network storage or S3 storage (which is gaining popularity because of its scalability benefits). Here, we like to work with SUSE Enterprise Storage for which we recently started the official certification process. We also certified and verified its functionality and performance when used in combination with Kopano for enterprises. 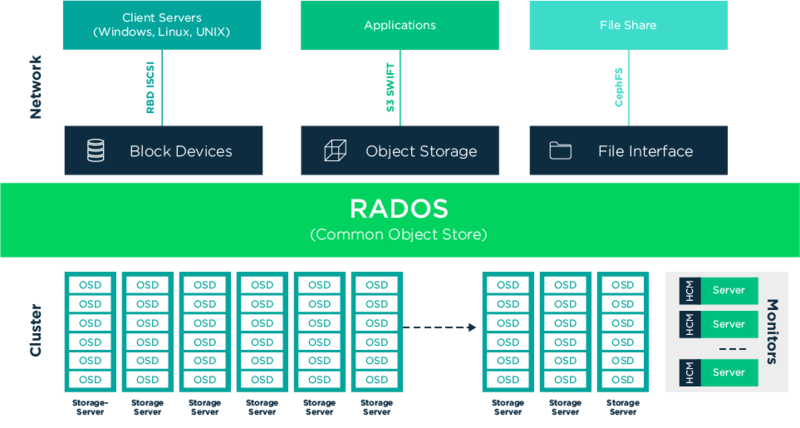 In this blog post we’d like to share our enthusiasm for SUSE Enterprise Storage and explain how enterprise customers can benefit from it in combination with Kopano. Running Kopano has, as any groupware based solution, certain requirements when it comes to storage. As a simple matter of fact, no user wants to wait long for a user interface to interact. Snappy behavior of the application users work with is key for great user experience. While Kopano utilizes caches to keep the most recent data in memory to keep RTT (round trip times) of requests as low as possible, not all operations can be handled by caches – especially with write operations data shouldn’t be cached only since in large environments users interact with different nodes. Aside from that, admins need to take care of data growth requirements. With more and more users chunking years of data, the effective labor cost to clean up mailboxes in many cases exceeds the cost of maintenance of storage, especially in larger corporations. This ends up with about any communication solution nowadays to have a special eye on fast, extensible storage solutions that grow with the requirements over time. We as Kopano naturally helped in the definition of required IOPS based on the requirements customers and partners approached us. This sounds like a simple task, but in reality, this is not the case, since the required storage parameters require a vast amount a metrics that most customers are not able to offer in a precise way. This is important since the traditionally expected user pattern of communication solutions drastically shifted over the last decade. As an example: While it was easily possible to calculate 2 devices per user 10 years ago, now many environments require 3+ devices per user. Todays’ reality: PC, extra Notebook, Mobile Phone, Tablet also with multiple applications, often at the same time and with integrations into other systems just grow the resources demand not only on the server/application side but also on all components below in the stack. This growing demand is one of the reasons why Kopano now has started to verify SDS (Software Defined Storage) stacks for larger stacks, to make sure current and future customers get the desired certification for the solution they use or intend to use in the future. What storage demand does Kopano have? As mentioned earlier, this is something that is practically impossible to answer without some key facts about the environment. In reality, one can run Kopano on a Raspberry Pi 3+ with 3 users for home usage. It will not be lightning fast, but for the occasional home use, this is probably decent enough for most home users. Please note again, that these numbers are very rough and highly depend on the effective usage of users based on the average usage pattern, such as concurrent usage and number of devices and many more factors. SUSE Enterprise Storage’s technology under the hood is based on CEPH combined with the beautiful web management solution openAttic. With SUSE Enterprise Storage, it is simple for Kopano customers to use storage not only for Kopano installations but instead for about any solution with demand for well-performing storage while keeping cost under control. Providing both block and object storage, Kopano can utilize the best of both worlds based on its functionality that provides the most efficient storage also for out-scaling environments. Also, using replication and erasure coding make SUSE Enterprise Storage an ideal, durable platform for taking care of precious communication-related data. How does it work with Kopano? At the same time, there is room for more like with ISVs that integrate perfectly with Kopano: ownCloud, OnlyOffice, and others. How can I get started with SUSE Enterprise Storage and Kopano? Want to know how Kopano combined with SUSE can benefit you? Send us an email (info@kopano.com) or give us a call (+31 (0)15 7504712).